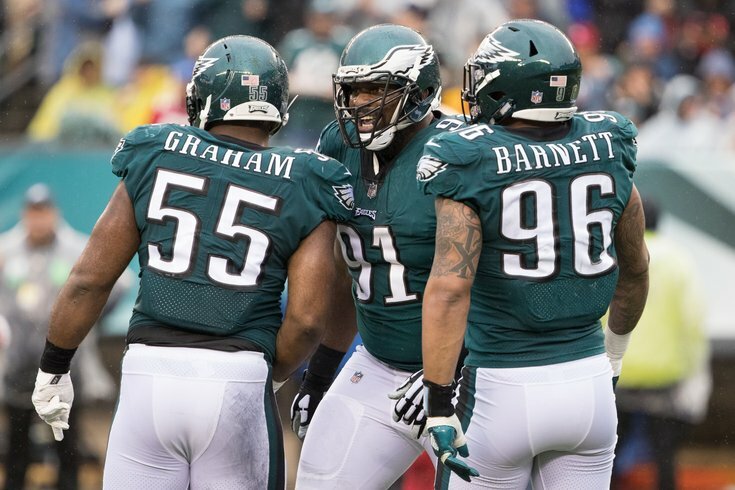 The Eagles' defensive line is one of the best units in the NFL. Super Bowl Sunday is finally here, two weeks after the Philadelphia Eagles punched their ticket to the big game with a blowout win over the Minnesota Vikings in the NFC Championship Game. And you know what? I think they're going to win for the following 10 reasons. In the second half against the Falcons in the divisional round, the Eagles' offensive line looked downright dominant. Against an excellent Vikings defensive front, the Eagles were effective enough running the football, which opened up opportunities in the passing game. The Eagles have the best offensive line in the NFL, and the Patriots' front seven is among the least talented groups they'll face all season. I see this as a major mismatch in the Eagles' favor, as the offensive line should continue to provide daylight for the running backs. The Eagles will not only be able to run the ball, but there's every reason to expect them to be able to pass protect efficiently, as they've done all season. The one iffy matchup to watch is Halapoulivaati Vaitai vs. Trey Flowers, the Pats' best pass rusher, though Flowers is nowhere near the talent of Vaitai's most recent assignment, the Vikings' Everson Griffen, who Vaitai shut down in the NFC Championship game. The Eagles have seen stud pass rushers all season long, and the Patriots simply don't have the same level of talent in that area as many of the teams they have faced. Assuming Nelson Agholor gets over his flu and is in good shape to play tonight, he will be a major matchup advantage over former Eagles cornerback Eric Rowe, who is playing out of position in the slot. Rowe has great size at 6'1, 205, and a fast 40 time. On a straight line, Rowe can be very fast, and his best moments with the Eagles often came when opposing offenses tested him deep. When asked to change direction in shorter areas, however, Rowe is not quick, or light on his feet. For that reason, he is not an ideal slot corner. Meanwhile, after two terrible seasons to start his career, Agholor got kick-started with a move into the slot, where his quickness has been better utilized. Doug Pederson has to love this potential matchup. All the attention this week has been focused on Patriots tight end Rob Gronkowski, and rightfully so. Gronkowski is arguably already the best tight end ever, and he was a major news story this week, as he was trying to clear the NFL's concussion protocol, which he eventually did. However, Eagles tight end Zach Ertz is no slouch either. He be covered most of the day by Patriots safety Patrick Chung. While Chung has had a very good season, he is only 5'11, and thus giving up seven inches to the 6'6 Ertz. In the NFC Championship Game, Ertz was able to get open with outstanding route running against All-Pro safety Harrison Smith. He should be able to find a way to get open against Chung. For the four reasons above (mostly the offensive line's significant advantage over the Patriots' front seven), Eagles quarterback Nick Foles should have time to throw, while also benefiting from a rushing attack that keeps the Eagles in manageable second- and third-down situations. Foles will not have to put the Eagles on his back. He merely needs to do his job, run the offense, and make the appropriate reads. He does not have to be Superman. That is a role that suits him well, and it is when he has flourished. On a side note, Foles has struggled in cold weather. He doesn't need to worry about that in the dome. Once again, on the other side of the ball, the Eagles have the matchup advantage and should control the line of scrimmage, as they've done all year. The Patriots' offensive line is solid and doesn't have any obvious weak links. However, they also lack great players along their line, and they will be facing the best defensive line they've seen all year. The Eagles had the No. 1 rush defense in the NFL this season while having faced far more dangerous rushing attacks than what the Patriots have to offer. Like they've done against almost all the other teams they have faced this season, they should be able to make plays in the Patriots' backfield against the run. Certainly, the Patriots will incorporate a quick passing attack to help slow the Eagles' pass rush. However, they will also take their shots down the field. When they do, the Eagles' fearsome pass rush will have their opportunities to get after Brady, and they will be very difficult for the Patriots to block. On the season, Brady was sacked 35 times. He's not as untouchable as he has been in previous years. Somebody is going to win their one-on-one matchup along that line. The Patriots have perhaps the best player in the history of the NFL in Tom Brady, which is obviously a huge check mark in their favor. From 1-to-53, however, the Eagles are a much more talented team. They are far better in the trenches, their defense is very clearly better, and the offenses, as a whole, aren't really that far apart. Yes, Brady has been there and done that, over and over, but this is not one of the better Patriots teams that has made it to the Super Bowl over their extraordinarily impressive 17-year run. They are vulnerable in a number of areas, and the Eagles have exploited teams with vulnerabilities all season. Bill Belichick is an outstanding coach, and perhaps the best of all time. And yet, crazy as this may sound, I trust Doug Pederson, Jim Schwartz, and Frank Reich to be able to go toe-to-toe with Belichick, Josh McDaniels, and Matt Patricia. Pederson and his staff have been outstanding all season long, devising creative game plans, making good play calls, executing time management efficiently, and making (correct) risky decisions, such as on fourth down, when appropriate. Opposing teams seem to lose their minds when they play the Pats, like Doug Marrone did in the AFC Championship Game, or the Atlanta Falcons did in the Super Bowl last year. The Eagles will not fall into that trap, and there's really no reason not to trust Pederson to call a good game at this point. I mean, it just is. Grease those poles.